I was having a blast with this build until I checked your video where I discovered stances are on RMB and attacks are on LMB. I changed it and now I keep dying because I struggle mechanically. When I want to move I attack. When I want to attack I move. Holding shift doesn't work well with melee skills, too often Numpty just stands there twiddling his axe. Is there a way to disallow move when attacks are bound to the LMB and have them function like on RMB? Hi, im melee sorc, but randomly found this labrys and put some jahs in it. I dont know what you can do about left click. Bind walk if you want to walk on left, and swap attack whenever you like. Another thing that interacts with it is d2stat option "continue attacking when monster dies under cursor" you can try checking that box in tab "options". 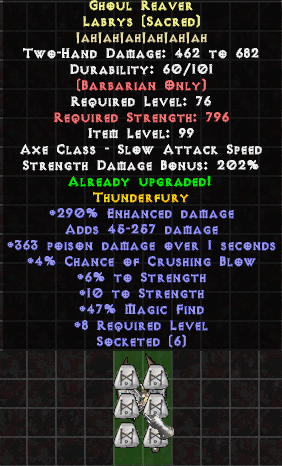 As for rare axe, good one, basically a decent craft. aerial wrote: I dont know what you can do about left click. Bind walk if you want to walk on left, and swap attack whenever you like. Thanks for taking the time to answer. I'll try the checkbox, I hope it'll improve gameplay. I don't see how the swap will improve gameplay - I'll have to swap to LMB attack when there are mobs close by, getting me right back to the situation I'm trying to avoid. Thanks for the guide, I'm following it however I don't get how do you get enough str to wear all those TU / items. Nevertheless twinked or untwinked. Some guides I saw they have full TU3/4 when they're only lv 8x but how can it be done ? Even if I put all into str I still cant use them unless I put jewels / gems into slot, which again lowered my stats / res. Is there a general strategy to be able to equip those high requirement item while leveling ? ( pre 100 / 120 ) ?? 3. You don't need to use T4 item if it has exceptionally high requirement, switch to it later. Thanks for the tips. I'm 108, have almost everything in the guide ( TU4 uniques - weapon unique coming storm, max res ), but my defense with bear stance is only 38k and almost everything kills me in 2-3 hits in Hell, I can't progress any further nor knowing what's wrong with the build. is it suppose to be tanky ? But apart from the jewels which Im using ( some rare craft with +% xp for leveling ) and rings / amulet I don't see any much differences. But literally anything can kill me if a few hits, are jewels and rings that important `? How can I raise my defense higher ( What's the most impactful item for gaining defense ? ). For example the adds in death projector or Island of the sunless sea ( dark templar ) cut me off in 1 hit with 7k life. blah2224 wrote: Thanks for the tips. I'm 108, have almost everything in the guide ( TU4 uniques - weapon unique coming storm, max res ), but my defense with bear stance is only 38k and almost everything kills me in 2-3 hits in Hell, I can't progress any further nor knowing what's wrong with the build. is it suppose to be tanky ? But apart from the jewels which Im using ( some rare craft with +% xp for leveling ) and rings / amulet I don't see any much differences. But literally anything can kill me if a few hits, are jewels and rings that important `? How can I raise my defense higher ( What's the most impactful item for gaining defense ? ). For example the adds in death projector or Island of the sunless sea ( dark templar ) cut me off in 1 hit with 7k life. Runemaster helps a ton. I'm guessing with your defense you don't have Runemaster yet? I think I had over 400k around 100ish if not 500k. Runemaster + Bear combo should get you a ton of defense, Alot more than 38k. I assume that summoner barb is the best farming build, right? So how good as a farmer is he compared to other characters with suitable farming builds? It really depends, summoner is just lazy build where you teleport around, but it isn't the fastest farmer of barb builds.